Deaths from Ebola are happening in some of the poorest places in the world – Sierra Leone (623), Liberia (2,069), and Guinea (739) – and localised outbreaks are occurring in Senegal and Nigeria. Across West Africa, it is estimated that by January 2015 more than 1.4 million people could have died during the current epidemic if its rate of progress is not halted. On Thursday 2 October, at the request of the United Nations Secretary General, Ban Ki Moon, some 20 countries met in London to discuss a coordinated response. Prior to the Conference he had contacted a number of countries asking for their support. According to World Health Organisation Director General, Dr Margaret Chan, Cuba was the first to respond pledging doctors and paramedics to combat the disease. Out of 15,000 Cuban health care workers who volunteered for the fight against Ebola, 461 were selected. They will go as part of the Henry Reeve International Brigade, which was formed in 2005, when Cuba’s offer to send 1,586 health care workers to help victims of Hurricane Katrina in Louisiana was snubbed by the U.S. government. They have been undergoing intensive training in coordination with Doctors Without Borders and the World Health Organisation. In stark contrast to the Cuban response the United States of America has sent 3,000 troops to Liberia. The initial group of 63 doctors and 102 nurses with specialists in infection control and intensive care programmes arrived in Sierra Leone on the same day as the London conference. They will stay for at least six months and join the team of 23 Cuban doctors already in the country who have been working to help build a health infrastructure in this country of around six million people. Following training in Havana at a hospital specialising in the control of infectious diseases, a further group of 300 medical specialists are set to join their colleagues in the near future. “Many countries have offered money, but no other country has offered such a large number of workers to go in and help do the most difficult jobs in this crisis,” said Dr. Bruce Aylward, assistant director of the World Health Organisation. 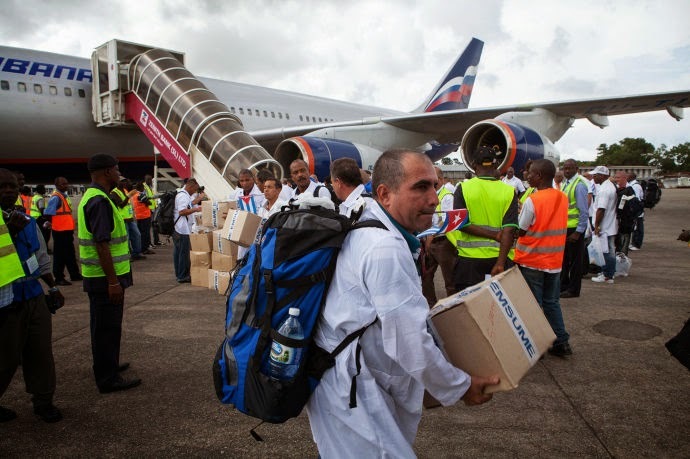 Cuba is planning to send a further group of 300 volunteers and to expand its operations into Guinea and Liberia. An initial group of 50 health experts arrived in Liberia at the beginning of October. The group is led by Dr Juan Carlos Dupuy, an experienced doctor and veteran of the Cuban health teams which worked in Pakistan in 2005 to help earthquake victims. Dr Dupuy also toured the UK with CSC in June 2006 to talk about the work of these medical brigades. As part of the response to the international call for help, Britain is planning to establish a 700 bed hospital in Sierra Leone. This is a tragic irony given that the Coalition Government had just cut aid to the country by around 20 percent. Nevertheless, it provides an important opportunity for Cuba-Britain cooperation. With the expansion of the contribution made by the island, Cuban health workers will now also be working in Liberia where the United States of America will have staff on the ground. Cooperation between the UK and Cuba in Sierra Leone will be absolutely essential to ensure an effective outcome for the people of the countries concerned and this will be true in equal measure for Cuba and the USA in Liberia. It’s to be hoped that this experience will bring the British government and that of the United States round to the view that not only should they respect Cuba’s sovereignty as a matter of principle but that there are in addition many positive things to be gained from cooperation between Cuba and the two countries. It would be good too if that message got out to Europe as a whole but most importantly that it had an impact in the United States of America. The views expressed by the Deputy Minister embody the longstanding practice of Cuba’s approach to health issues. They have consistently combined rapid emergency intervention with programmes to sustain the development of the local health care system. In 2005 Cuba sent 2,465 health professionals to Pakistan to care for the emergency needs of people in Kashmir whose lives had been shattered by a massive earthquake. Cuba had had no diplomatic relations with the country before these events. Nevertheless the Cuban health teams went to areas which even the Pakistan government found difficult to access. Over 70 per cent of all the medical interventions in the aftermath of the earthquake were carried out by the Cuban medical teams. But this wasn’t the end of the story. Cuba donated the 32 field hospitals they had been using, to the people of Pakistan and, more importantly, agreed to set up a programme for students from the country to train as doctors in the Latin America School of Medicine in Havana. One thousand scholarships were provided to Pakistan and the latest group of 600 will graduate from the school in February 2015. In so doing the Pakistan students have become part of the 19,000 young people from over 110 countries registered in 2013. This practice of responding to immediate needs and contributing to a more sustainable development contrasts with the kind of relations between poor countries in Africa and elsewhere and the richer countries of the world. Sierra Leone is desperately short of medical practitioners yet some ten percent of nurses from the country are in fact working in Britain. Cuba’s measures will contribute to reversing the flow of medics from a country which desperately needs the skills of its entire medical staff. Cuba’s record of medical solidarity is second to none. In the last 55 years since the revolution some 325,710 medical workers have treated an estimated 85 million people in 158 countries around the world saving more than 600,000 lives. In the decade from 2004 – 2014 some 2.4 million operations have been carried out through the ‘Operación Milagro’ programme to save the sight of people in countries across the world. All of this has been carried out without hesitation. Cuba never places conditions on its intervention. In 2005 over 1,500 paramedics stood ready to go to the United States of America following the devastation reeked by Hurricane Katrina on New Orleans and the surrounding area. The White House never responded to the offer despite the fact that the Cubans placed no preconditions on their aid. Let’s hope that the experience of working together in Liberia might help to change this attitude. If Britain were to emulate Cuba’s efforts you could multiply all these figures by six! Just imagine if that were replicated by all the wealthy countries of the world. The lives of billions could be transformed. Once again Cuba proves that another world is possible.